Roman Imperial Coinage - Civil wars (68-69 AD). 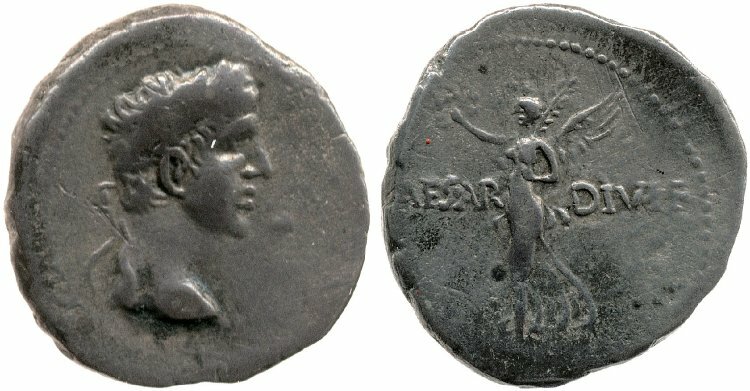 AR Denarius, Spain, April-June 68. BON EVENT Female head right, wearing fillet in hair. Rev. PACI PR Clasping hands, holding caduceus. Rare. Toned and very fine. 5 AR Denarius (3.49 g, 6h). Spanish mint. PACI P R, Female bust right, fillet round forehead and hair knotted above neck. Rev. BON EVENT, Clasped right hands holding winged caduceus. RIC I 5; BMC 3. Different feature AR Denarius (3.14 g, 6h). Spanish mint. 9 AR Denarius (3.64 g , 5h), Spain, April-June 68. BON EVENT Female head right, wearing fillet in hair. Rev. ROMA RENASC Roma standing right, holding Victory in her right hand and scepter with her left. BMC 9. C. 396. Martin 52 (this coin cited). Nicolas 49MZ (this coin). RIC 9. Vagi 755. Rare. Attractively toned. Nearly extremely fine. 11 AR Denarius (3.57 g, 6h). Spanish mint. BONI EVENT Diademed and draped female bust right. Rev. ROMA RENASCES, Roma standing right, holding Victory and spear surmounted by eagle. RIC I 11; AM 53; RSC 400. 14 AR Denarius (3.15 g, 6h). Spanish mint. BONI EVENTVS Female bust right, diademed. Rev. VIRTVS Virtus standing left, right knee bent, holding Victoriola in right hand and parazonium in left hand. RIC I 14; BMC 14. 17 AR Denarius (3.84 g, 6h). Spanish mint. GENIO P R Bare head of Genius to right, behind cornucopia. Rev. MARTI VLTORI, Mars advancing right, holding spear in right hand, shield in left hand and parazonium on left side. RIC I 17; BMC 1. 18 AR Denarius (3.38 g, 6h). Spanish mint. GENIO P R Bust of Genius right, bare-headed with short hair and wearing wreath of berries or flowers; behind, cornucopia. Rev. MARTI VLTORI, Mars advancing right, holding spear in right hand, shield in left hand and parazonium on left side. 20 AR Denarius April-June/July 68, Spanish mint in support of Galba. 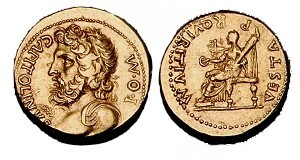 3,58 g.
GENIO P R Diademed bust of Genius to l., cornucopia behind. Rev. MARTI – VLTORI Mars standing facing, head to l., in r. hand spear, in l. hand shield. RIC 20. BMC pl. 49,15. C. 384 var. Vagi 757 var. Of highest rarity. Small planchet fault on edge. Very fine. 24 AR Denarius (3.00 g, 5h). Tarraco mint. 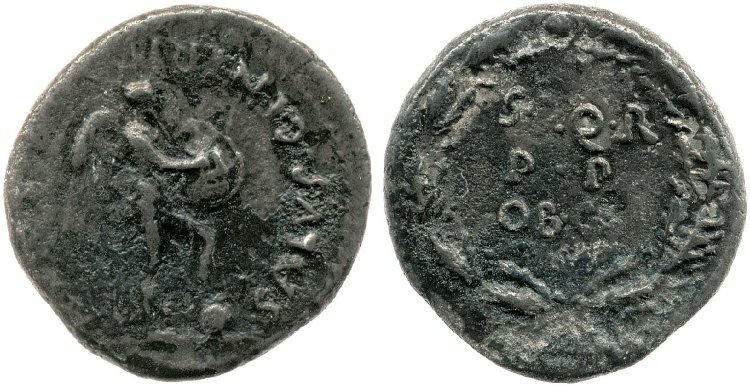 Struck under Galba in Spain, April-June AD 68. LIBERTAS, draped bust of Libertas right / RESTITVTA P-R, pileus (cap of liberty) between two daggers. RIC II 24; AM 49T (same reverse die as the example in Turin); RSC 394. 25 AR Denarius, Spain 68-69, 3,41 g, 6h. LIBERTAS P R Draped bust of Libertas r., wearing necklace. Rev. RESTITVTA Pileus between two vertical daggers. 27 AR Denarius, Spain 68-69, 3,37 g.
LIBERTAS – RESTITVTA Draped bust of Libertas r., wearing necklace. Rev. S P Q R on shield within oak-wreath. C Galba 431. BMC 12. RIC 27. CBN 10. Martin 91. Unlisted AV Aureus, Spain 68-69. 28 AR Denarius, Spain 68-69, 3,28 g, 6h. LIBERTATI Citizen advancing right, wearing toga and pileus, holding up wreath in right hand. Rev. RESTITVTA Victory standing right on globe, holding wreath in right hand and palm in left hand. 34 AR Denarius (2.89 gm, 6h). Spanish mint. ROMA Roma seated left on cuirass, holding Victory and resting hand on parazonium; foot set on helmet. Rev. PAX Clasped hands holding winged caduceus between two stalks of grain and two poppies P - R in field. RIC I 34; AM 48; BMCRE 6; RSC 398. VF, toned, light obverse scrape at center and edge, porous. Very rare. Classical Numismatic Group Sale 69 - 8 June 2005. 37 AV Aureus (7.13 gm, 7h). Gallia Lugdunensis, A.D. 68-69. Bust of Minerva, draped, wearing aegis, helmeted right. Rev. SECVRITAS P R Securitas, wearing long tunic and cloak seated right on throne, resting head on right hand, right elbow on back of throne and holding sceptre in left, in front lighted altar hung with garlands. RIC I 37; BMCRE 37. 39 AR Denarius. Gallia Lugdunensis, March-May A.D. 68. Mars bust to right, helmeted and draped. Rev. P - R in field, SIGNA in exergue, Aquila between two standards, altar between aquila and right standard. 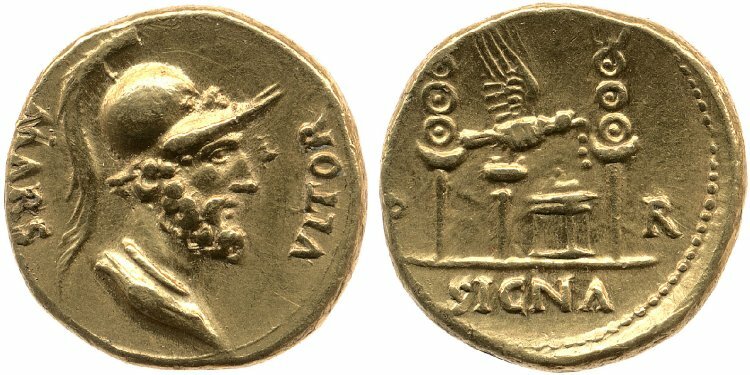 43 AV Aureus (7.13 gm, 7h). Gallia Lugdunensis, A.D. 68-69. GENIVS P R Bust of Genius, bearded and diademed, right; behind, sceptre. Line border. Rev. MARS VLTOR Helmeted Mars, unclothed, advancing right, brandishing javelin with right hand and supporting shield on left arm, parazonium visible at left side. RIC I 43; BMCRE 21. 44 AR Denarius (3.18 gm, 6h). Gallia Lugdunensis, A.D. 68-69. 46 AR Denarius (3.54 gm, 4h). Gallia Lugdunensis, A.D. 68-69. GENIVS P R Bust of Genius, bearded and diademed, right; behind, sceptre. Line border. Rev. S P Q R within oak-wreath. RIC I 46. BMC 22. 48 AR Denarius (3.67 gm). Gallia Lugdunensis, March-May A.D. 68. G P R, diademed and draped bust of bearded Genius Populi Romani right, scepter over shoulder. Rev. MARS VLTOR, helmeted Mars, unclothed, advancing right, brandishing javelin with right hand and supporting shield on left arm, parazonium visible at left side. RIC 48. Cf. CBN 15 (aureus). 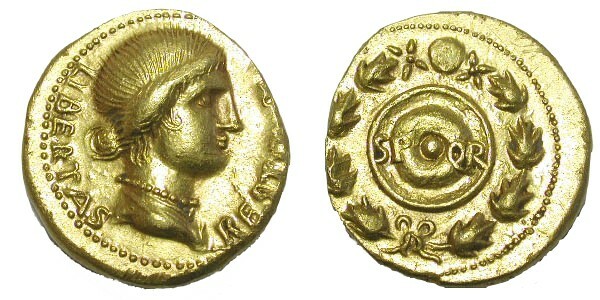 50 AV Aureus (7.34 gm, 6h). Gallia Lugdunensis, A.D. 68-69. MARS VLTOR Bust of Mars Ultor right, bearded, helmeted and draped. Rev. P - R in field, SIGNA in exergue, Aquila between two standards, altar between aquila and right standard. RIC I 50; BMCRE 38. 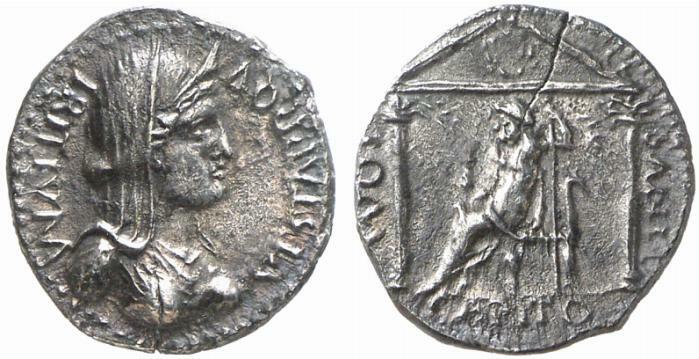 51 AR Denarius, Gaul circa 68-69, 3.43 g.
MARS – VLTOR Mars, naked but for helmet, advancing r., brandishing spear and holding shield; parazonium at l. side. Rev. S P Q R within oak wreath. 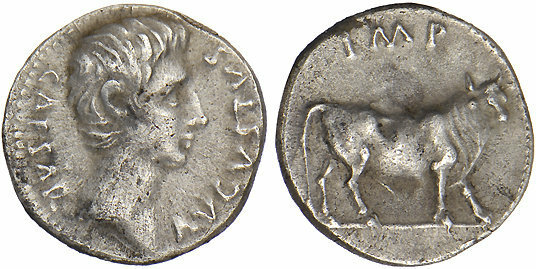 54 AR Denarius, Gaul circa 68-69, 3.43 g.
C Galba 414. BMC 23. CBN 23. RIC 54. P.H. Martin, Die Anonymen Münzen des Jahres 68 nach Christus, 71. 56 AR Denarius, Gaul circa 68-69, 3.42 g, 6h. PACI AVGVSTAE Pax-Nemesis, winged, advancing right, holding out fold of dress in right hand and left hand pointing caduceus at snake before her. Rev. S P Q R within oak wreath. 57 AR Denarius (3.56 gm). Gallic mint. PAX ET LIBERTAS, clasped hands; caduceus behind. Rev. P R across field, SIGNA in exergue, Legionary aquila before lighted altar; military standard on either side. RIC I 57; AM 66; BMCRE pg. 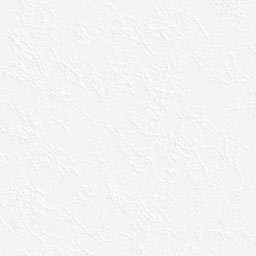 299 note; RSC 408a. 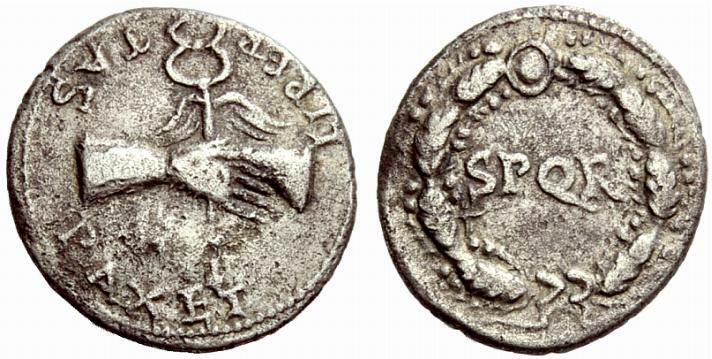 58 AR Denarius, Gaul 68-69, 2.94 g.
PAX ET LIBER-TAS Two clasped hands holding winged caduceus. Rev. SPQR within wreath. C 424. BMC 27. RIC 58. CBN 24. AM 82. 59 AR Denarius, Gaul circa 68-69, 3.42 g, 6h. ROMA Helmeted bust of Roma to right, with towered crown. Rev. IVPPITER CVSTOS Jupiter, naked to waist and with cloak falling from left shoulder, seated left, holding thunderbolt in right hand and vertical sceptre in left hand. 62 AR Denarius (17mm, 2.69 g). Mint in Gaul. ROMA RESTITVTA Helmeted bust of Roma right / IVPPITER LIBERATOR Jupiter seated left, holding thunderbolt and sceptre. RIC I 62; AM 20; RSC 374. 64 AR Denarius, Gaul circa 68-69, 2.23 g, 6h. SALVS ET LIBERTAS Helmeted female figure standing right, holding long vertical spear in right hand and left hand resting shield on ground. Rev. P R across field, SIGNA in exergue, Legionary aquila before lighted altar; military standard on either side. 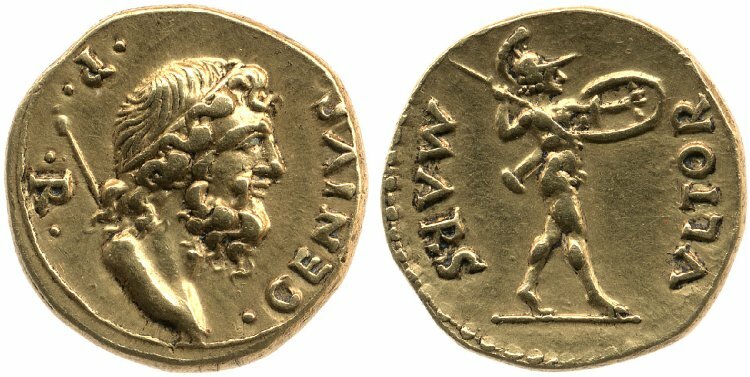 65 AV Aureus, Gaul circa 68-69, 7.4 g, 6h. SALVS ET LIBERTAS Helmeted female figure standing right, holding long vertical spear in right hand and left hand resting shield on ground. Rev. SPQR within wreath. 66 AR Denarius, Gaul circa 68-69, 2.39 g, 7h. 71b AV Aureus, Gaul circa 68-69, 7.72 g, 4h. SALVS GENERIS HVMANI Victory standing left on globe, right hand holding wreath, left holding palm. Rev. SPQR within wreath. 72a AR Denarius, Gaul circa 68-69, 3.22 g, 12h. 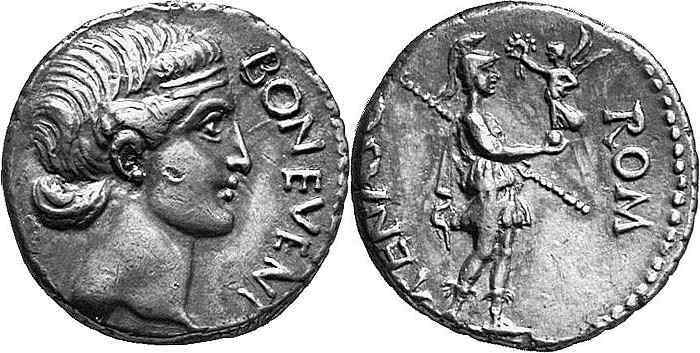 SALVS GENERIS HUMANIS Victory standing left holding wreath. Rev: SPQR in wreath. 73b AR Denarius (3.5 gm, 9h). Gallic mint. Struck circa 68-69. SALVS GENERIS HVMANI, Victory standing right on globe, holding palm and wreath. Rev. S P Q R, in one line within oak wreath. RIC I 73b; RSC 421. 74 AR Denarius (2.37 gm, 6h). Gallic mint. Struck circa 68-69. SALVS GENERIS HVMANI, Pax-Nemesis, winged, advancing right, holding out fold of dress in right hand and left hand pointing caduceus at snake before her. Rev. S P Q R, legend in one line within oak wreath. 76 AR Denarius (3.65 gm, 12h). Gallic mint. Struck circa 68-69. SALVS GENERIS HVMANI, Victory standing right with right foot on globe, inscribing V on shield balanced on knee. Rev. S P Q R / P P / OB CS, in three lines within oak wreath. 78 AR Denarius (2.95 gm, 6h). Gallic mint. Struck circa 68-69. VIRT, Bust of Virtus, helmeted, right. Rev. 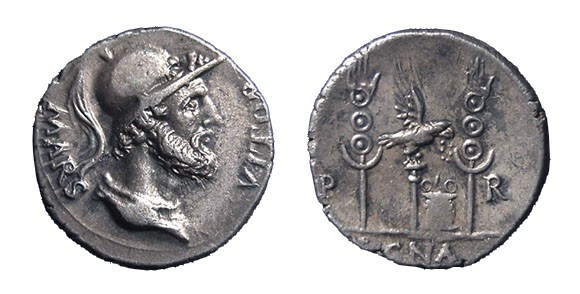 IVPPITER CVSTOS, Jupiter, naked to waist and with cloak falling from left shoulder, seated left, holding thunderbolt in right hand and vertical sceptre in left hand. RIC I 78. BMC 18. 78A AR Denarius (3.61 gm, 6h). Gallic mint. Struck 68-69 AD. VIRTVS Helmeted bust of Virtus to right. Rev : S P Q R around shield, crossed spears behind. 79 AR Denarius (3.19 gm, 6h). Gallic mint. Struck 68-69 AD. VOLKANVS VLTOR Bust of Vulcan, bearded, right, wearing round cap. Rev. GENIO P R Cap of Vulcan (?) over anvil, with tongs on left and hammer on right. RIC I 79. BMC 16. 81 Aureus, Spain and Gaul 68-69, AV 7.50 g.
Bare head of Augustus (?) r. Rev. Capricorn bearing cornu- copiae on its back and holding globe and rudder; below, AVGVSTVS. C 20. BMC 44 and pl. 51, 1 (these dies). RIC 81 (these dies). CBN –, cf. 48 (denarius). Martin -, cf. 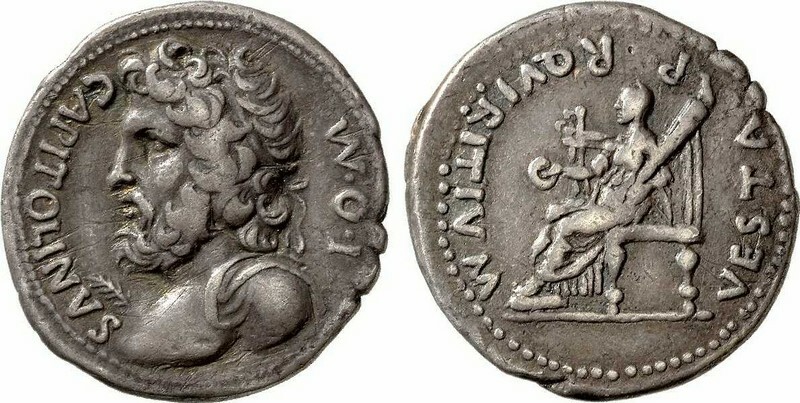 A2 (denarius). Calicó 164a. 82 AR Denarius (3.7 gm, 11h). Gallic mint. Struck 68-69 AD. Head of Augustus, bare, right. Rev. AVGVSTVS Capricorn right, holding globe to which rudder is attached; above, cornucopia. RIC I 82. BMC 46. 88 AR Denarius (3.38 gm, 6h). Spanish mint. Struck 68-69 AD. Head of Augustus, bare, right. Rev. 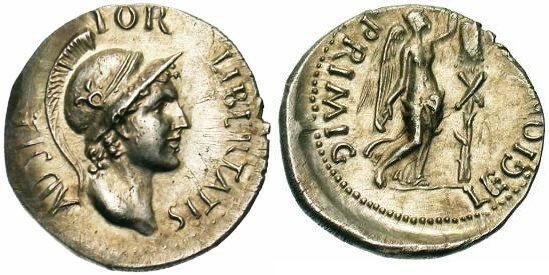 CAESAR – DIVI F Victory standing left, holding wreath in right hand and palm in left hand over left shoulder. RIC I 88. BMC 48. 92 AR Denarius (3.30 gm). 'Augustus' issue. CAESAR AVGVSTVS, laureate head of Augustus right / DIVVS IVLIVS, eight-rayed comet. RIC I 92; Martin A10; BMCRE 49; BN -; RSC 98a. 94 AR Denarius, restored Augustan issue. March-May 68 A.D. Vienne. 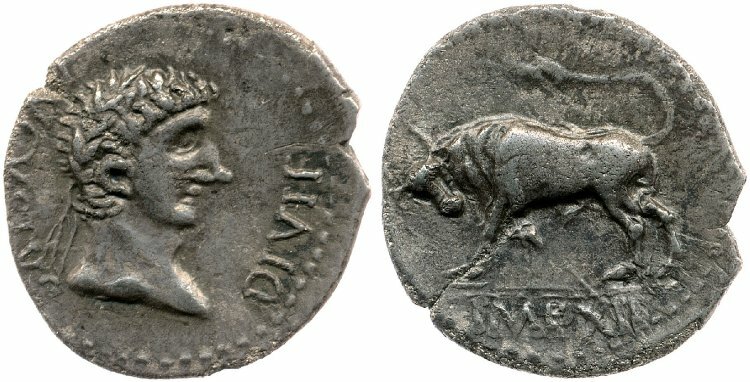 Bare head of Augustus r., CAESAR AVGVSTVS. Rv. Bull walking r., IMP. above. RIC-, BMC-, cp. RIC 94. 100 AR Denarius (3.36 gm, 6h). Spanish mint. 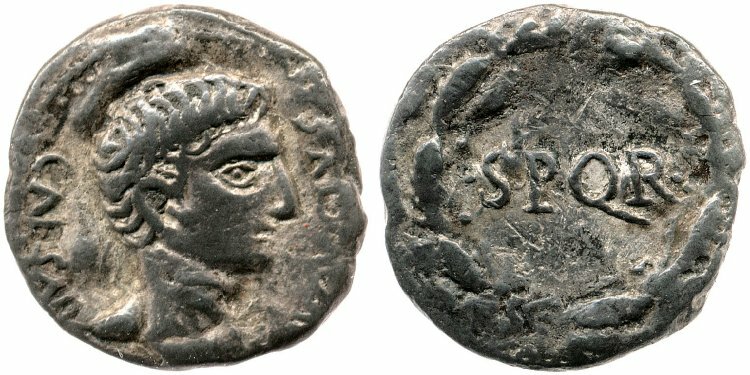 Struck 68-69 AD. AVGVSTVS DIVI F Head of Augustus, bare, right. Rev. IMP XII in exergue, Bull butting left. RIC I 100. BMC 51. 102 AR Denarius (2.86 gm, 6h). Mint in Gaul or Spain. Struck March-May 68-69 AD. AVGVSTVS DIVI F Head of Augustus, bare, left. Rev. OB / CIVES / SERVAT, in three lines within oak wreath. RIC I 102. BMC 52. 104 AR Denarius (3.34 gm, 6h). Mint in Gaul or Spain. Struck 68 AD. AVG DIVI F P P Head of Augustus, bare, right. Rev. S P Q R within oak wreath. RIC I 104. BMC 53. 105 AR Denarius (3.17 gm, 6h). Mint in Gaul or Spain. Struck 68 AD. CAESAR AVGVSTVS Head of Augustus, bare, right. Rev. S P Q R within oak wreath. RIC I 105. BMC 54. 106 AR Denarius (3.17 gm, 6h). Mint in Gaul or Spain. Struck 68 AD. CAESAR AVGVSTVS Head of Augustus, laureate, right. Rev. S P Q R within oak wreath. RIC I 106. BMC 55. 109 AR Denarius (3.66 gm, 6h). Mint in Gaul or Spain. Struck 68 AD. AVG DIVI F P P Head of Augustus, laureate, right. Rev. S P Q R / P P / OB CS, in three lines within oak wreath. RIC I 109. BMC 56. 110 AR Denarius (3.45 gm, 6h). Mint in Gaul or Spain. Struck 68 AD. AVGVSTVS DIVI F Head of Augustus, laureate, left. Rev. Victory advancing left, holding shield inscribed CL V.
RIC I 110. BMC 57. 114 Aureus, Spain and Gaul (?) 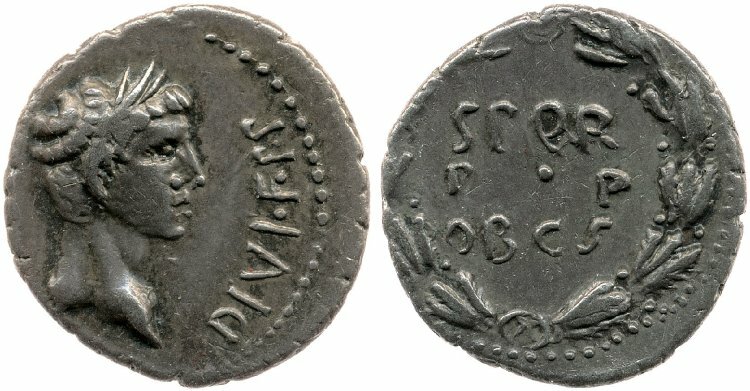 68, AV 7.25 g.
DIVVS – AVGVSTVS Radiate head of Augustus r. Rev. PAX Pax standing l., holding caduceus in r. hand, corn ears and poppies in l.
C –. BMC –. RIC 114. CBN 65. Martin A24B (these dies). Calicó 454 (these dies). Extremely rare and an issue of tremendous fascination and historical importance. 116 AR Denarius (3.29 gm, 8h). Mint in Gaul or Spain. Struck 68 AD. DIVVS AVGVSTVS Head of Augustus, radiate, right. Rev. SENATVS P Q ROMANVS Victory advancing left, holding shield inscribed VI / AV. RIC I 116. BMC 59. Different feature AR Denarius (3.43 gm, 6h). Mint in Gaul or Spain. Struck 68 AD. 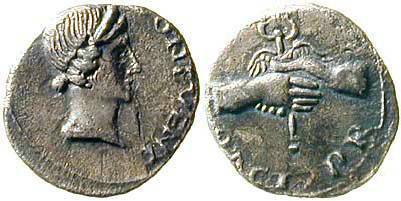 118 AR Denarius, Southern Gaul circa 68-69, AR 3.53 g.
FIDES / EXERCITVM Clasped r. hands. Rev. CONCORDIA PRAETORIANORVM Concordia standing l., holding branch and cornucopiae. C Galba 359. BMC 61. CBN 71. RIC 118. Martin 3. 120 AR Denarius (3.08 gm, 6h). Mint in Gaul. Struck 69 AD. FIDES / EXERCITVM Clasped r. hands. Rev. FIDES / EXERCITVM Clasped r. hands. 121 AR Denarius, Southern Gaul circa 68-69, AR 3.44 g, 7h. FIDES / EXERCITVM Clasped r. hands. Rev. 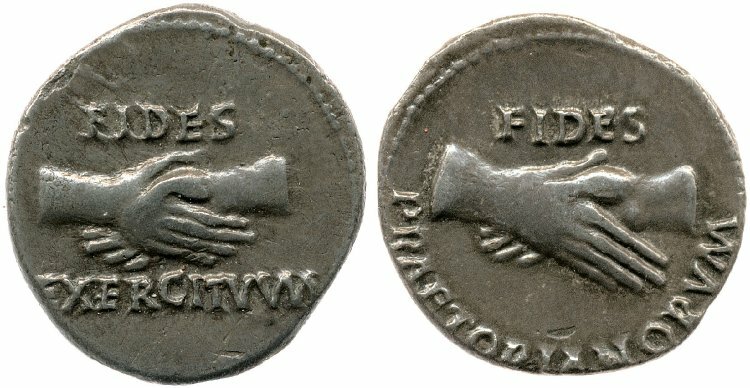 FIDES / PRAETORIANORVM Clasped r. hands. 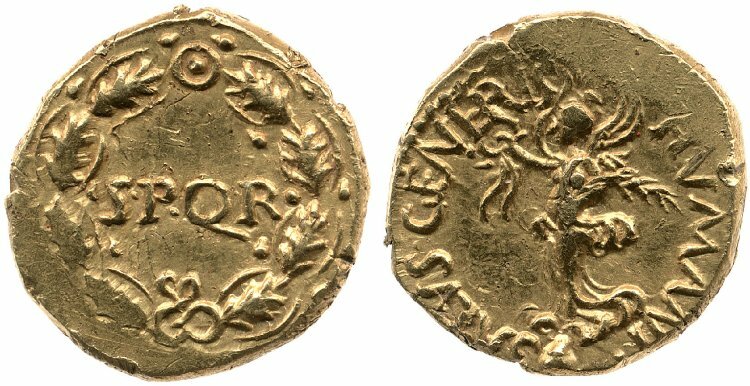 124 Aureus, circa 68-69, Southern Gaul (Nemausus?). 7,45 g.
I · O · M - CAPITOLINVS. Draped and diademed bust of Jupiter to left. Rev: VESTA - P - R QVIRITIVM. 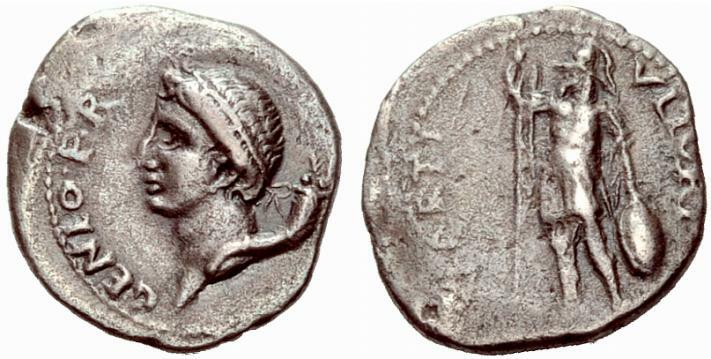 Vesta seated on throne, holding patera to right and long torch to left. 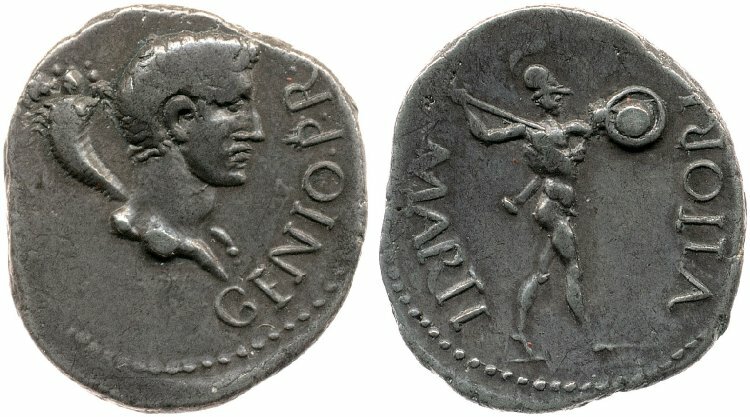 125a AR Denarius, circa 68-69, Southern Gaul (Nemausus?). 3,51 g.
I · O · M - CAPITOLINVS. Draped and diademed bust of Jupiter to left, palm-branch before. Rev: VESTA - P - R QVIRITIVM. 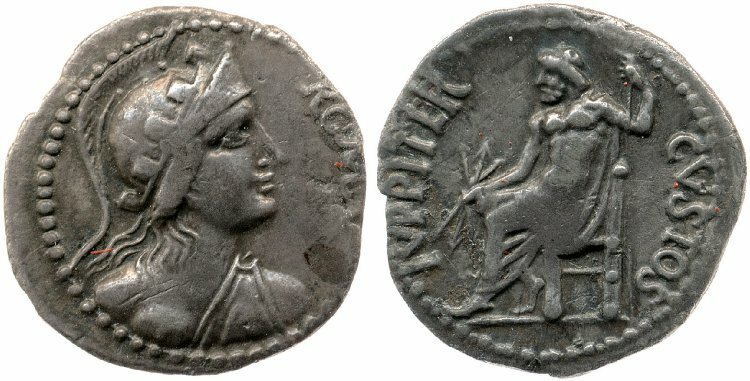 Vesta seated on throne, holding patera to right and long torch to left. RIC 125 (a). C. 432 (Galba). BMC 72. Martin 96. 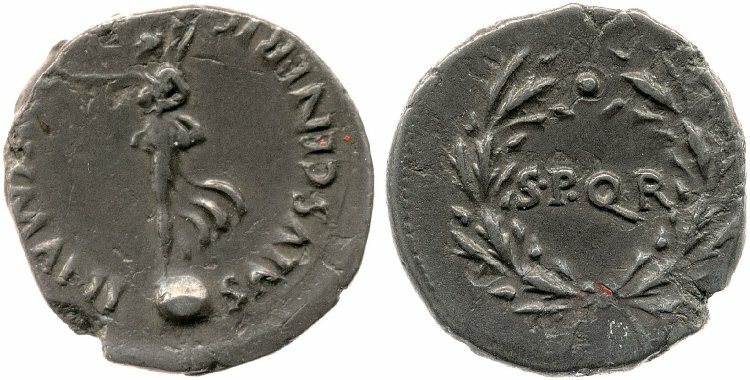 125b AR Denarius, circa 68-69, Southern Gaul (Nemausus?). 3,51 g.
RIC 125 (b). C. 432 (Galba). BMC 72. Martin 96. 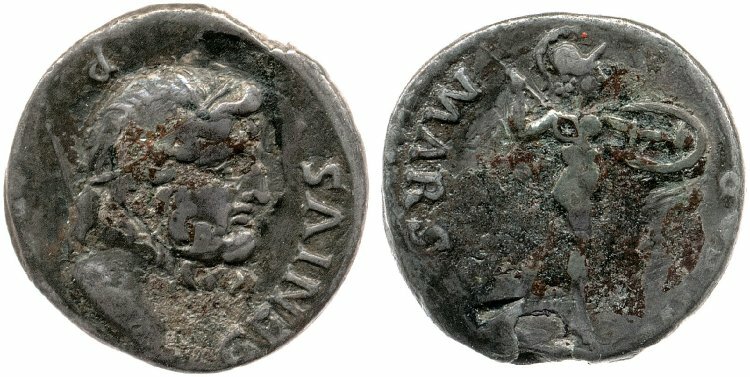 126 AR Denarius, circa 68-69, Southern Gaul (Nemausus?). 3,51 g.
VESTA P R QVIRITIVM. Draped and diademed bust of Jupiter to left. Rev. FIDES / EXERCITVM Clasped r. hands. 127b AR Denarius, 68, Southern Gaul . 3,34g. RIC 127 (b) var. C. - . BMC - . CBN - . 128 AR Denarius, 68, Southern Gaul . 2,62g, 5h. RIC 128. BMC 70 . 130 AR Denarius, 68, Germany . ADSER - TOR LIBERTATIS. Helmeted head of Mars to right. Rev. LEGIO XV PRIMIG. Victory to right, placing helmet on trophy. 135 AR Denarius, 68, African mint. 3,03 g, 12h. HISPANIA S C. Bust of Hispania right, laureate and draped; behind, two javelins; in front, two corn-ears; below, round shield. Rev. S P Q R around shield, crossed spears behind. RIC 135. BMC 15 . 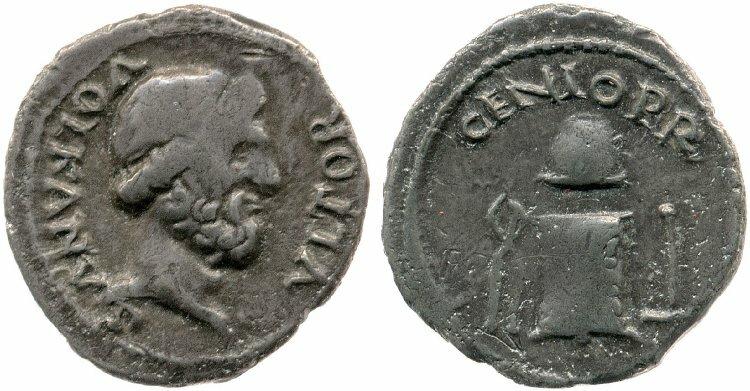 136 AR Denarius, April-June 68, African mint in support of Galba. 2,65 g.
VIRTVS Helmeted female head of Virtus to r. Rev. S P Q R counter-clockwise in the angles of two crossed spears on which round shield. RIC 136. C. -. Vagi 762.